A deconstructed gyros sandwich makes the BEST Greek salad, y'all! 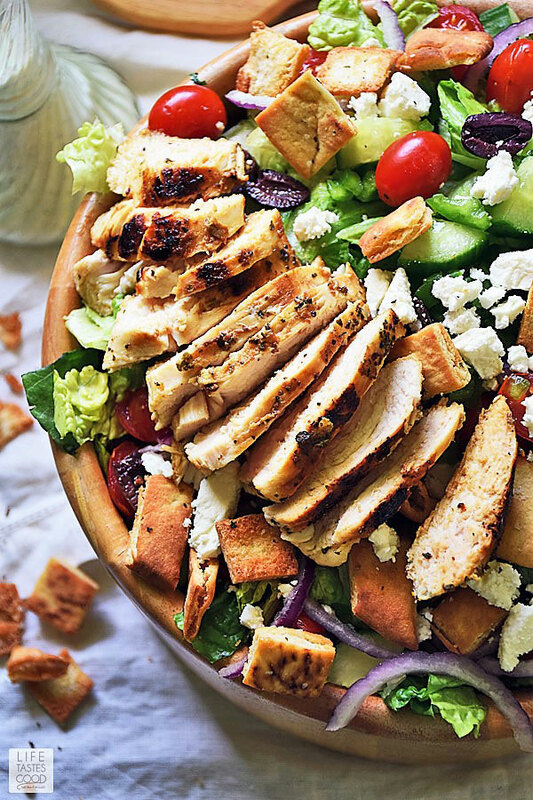 I was dreaming of a quick and healthy salad loaded with Greek inspired flavors, so I threw together this Gyros Salad with Chicken and we can't get enough of it! This salad was inspired by my Mediterranean Meatball Gyros Sandwich. I basically took the idea of the gyros sandwich and deconstructed it to make a salad. 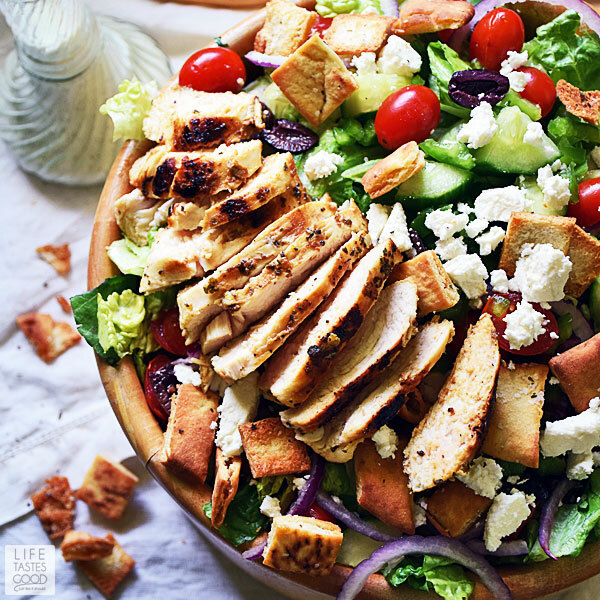 This Greek salad with lettuce has many of the ingredients in my gyros sandwich such as, red onions, cucumbers, and tomatoes, in addition to green peppers, Kalamata olives, the most flavorful marinated chicken, feta cheese, homemade pita croutons, and, of course, an irresistible creamy tzatziki dressing! Doesn't that sound glorious?! In recent years I have really come to appreciate all of the fresh flavors in Greek food. It all started with a very simple, low carb recipe for Greek Style Pork Chops. 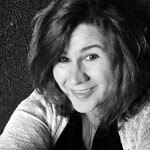 Paired with a fresh cucumber and tomato salad and topped with a dollop of tzatziki sauce, this recipe started my love affair with Greek food. It's why I've started creating recipes such as this Gyros Salad along with my Greek Bowl with Meatballs over CousCous. I can't get enough of all the fresh and exciting flavors in Greek inspired recipes! What is a Traditional Greek Salad? My Gyros Salad with chicken recipe is definitely NOT a traditional Greek salad. A traditional Greek salad includes tomatoes, cucumbers, green peppers, sliced red onion, Kalamata olives, and of course feta cheese. Traditionally, a Greek salad is dressed with extra virgin olive oil or a simple oil and vinegar dressing seasoned with dried oregano and sea salt. My Gyros salad went off the traditional rails, so to speak, right from the get go when I decided to use romaine lettuce, so I figured I'd keep bucking tradition by adding marinated chicken breast and dressing this non-traditional Greek Salad with a creamy tzatiziki sauce inspired dressing. I think you'll be glad I'm not a rule follower when you give this non-traditional Greek salad with lettuce a try. The flavors are bold and fresh, and because of the lettuce and chicken, this Gyros Salad is satisfying enough to serve as a main dish for dinner. Serve the salad with the tzatziki dressing and enjoy! Nagi over on recipetineats.com has a Chicken Souvlaki recipe I've been wanting to try, so I adapted her marinade for my Gyros Salad recipe and it worked out perfectly. 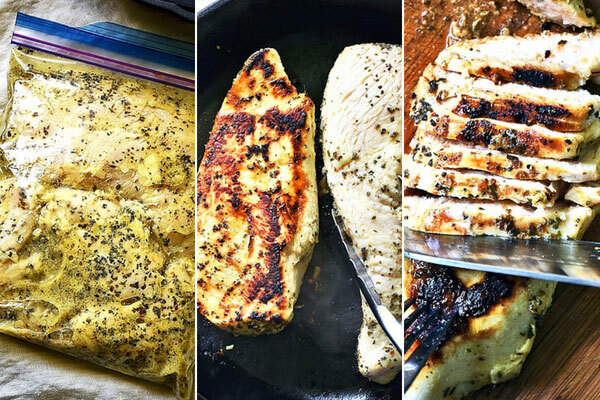 This Greek chicken marinade is delicious! It is loaded with oregano! I was a little worried it might be too much, but boy was I wrong. The oregano combined with the garlic and lemon really gives this chicken a ton of flavor. Try not to eat it all right out of the skillet!! 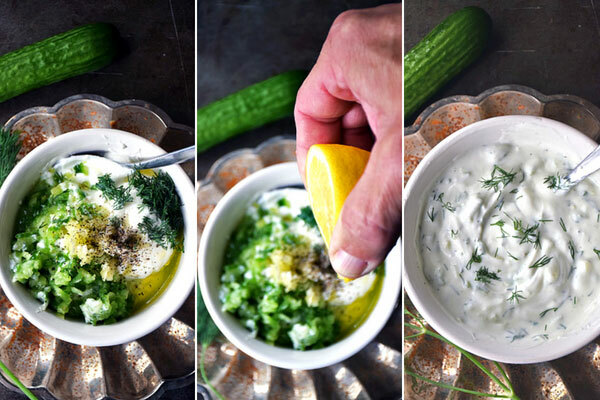 The tzatziki dressing can be made up early in the day or while prepping the rest of the ingredients. The dressing will have a deeper flavor if made up early in the day or a day ahead, but I'm not always that organized and it's still pretty darn tasty even made up right before serving. NOTE: Because this is a relatively small amount of dressing, I don't bother dirtying my big food processor. Instead I use my Smart Stick Immersion Blender with the small bowl food chopper attachment to mix this into a smooth dressing. It works great! 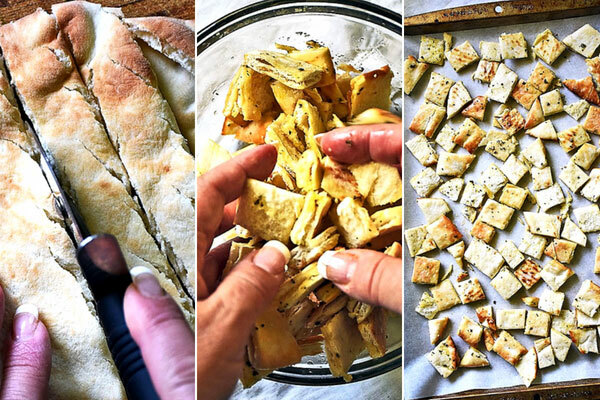 I first saw Pita Croutons on My Recipes and had to try them. I changed up the recipe a bit to suit our tastes, but the idea is the same and perfect for this Gyros Salad recipe. I think you'll be surprised by how easy pita croutons are to make and also by how incredibly addictive they are! Don and I typically eat these little bites of crunchy goodness right off the tray when they come out of the oven. They are so hard to resist. We love how crunchy pita croutons are, but at the same time, we love the softness inside with the little pocket of air in the middle. I season the croutons simply with salt and dried oregano and some olive oil. The salt, in particular, really makes these pita croutons so tasty! 1 1/2 cups diced cucumber. NOTE: Use an English cucumber (aka hothouse cucumber). English cucumbers are longer and more slender than regular cucumbers. They are typically not waxed so you'll find them wrapped in plastic instead. The seeds of an English cucumber are smaller and easier to eat. No need to remove the seeds when using in the salad. I like to cut about 1/2 the cucumber into strips and then dice. Serve with the tzatziki dressing and enjoy! A deconstructed gyros sandwich makes the BEST Greek salad, y'all! If you're dreaming of a quick and healthy salad loaded with Greek inspired flavors make this Gyros Salad with Chicken. You are sure to love it! When ready to cook the chicken, heat a cast iron skillet over mid-high heat. Remove the chicken from the marinade and carefully place the chicken into the hot skillet. Discard marinade. Sear chicken for about 5 minutes until a nice crust forms on the one side. Flip chicken over and add a tablespoon of butter to the skillet. Sear chicken for 5 more minutes while basting with butter. Chicken is done when the internal temperature is 165°F and no longer pink inside. Check temperature in thickest part of chicken breast using an instant read thermometer. When chicken is fully cooked, remove the chicken to a cutting board to rest for about 5 minutes. Combine 5 ounces Greek yogurt with 2 tbsps grated cucumber, 1/2 tsp freshly minced garlic, 1/2 tsp olive oil, 1/2 - 1 tbsp fresh dill, 1/2 tbsp of fresh lemon juice, 1/4 tsp kosher salt and an 1/8 tsp black pepper. Mix well. For a smoother salad dressing, process in a blender or food processor until smooth. 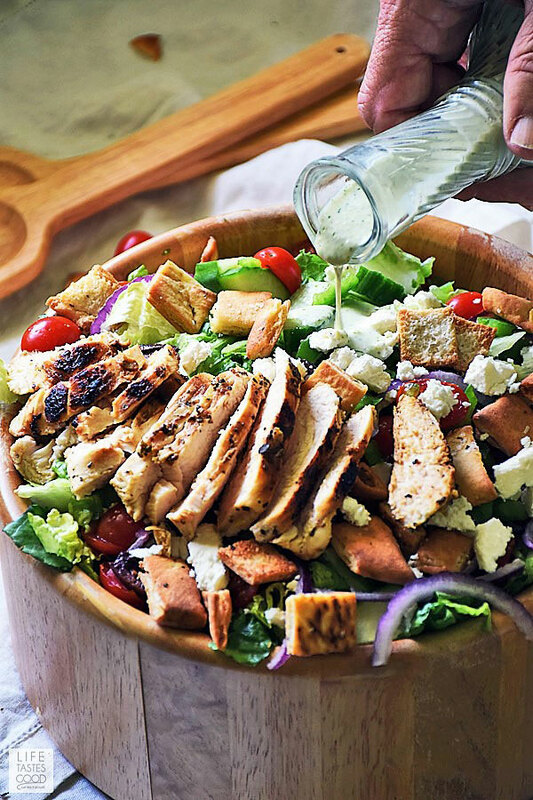 Give the tzatziki dressing a taste and adjust the flavors as needed. 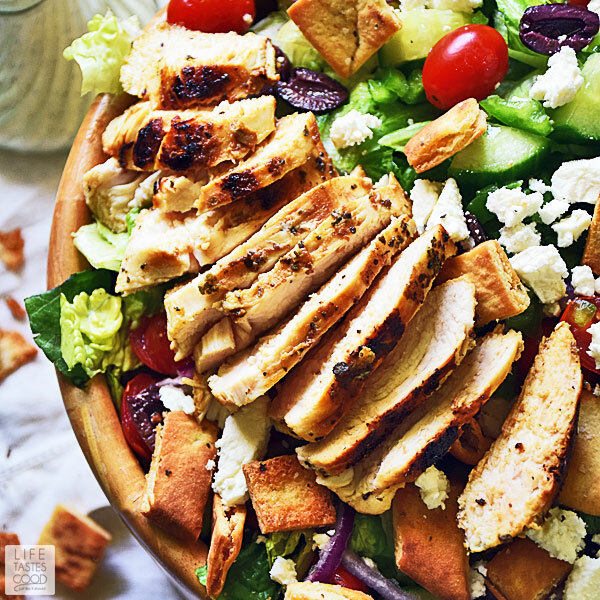 In a small bowl, combine pita croutons with 1 1/2 tablespoons olive oil, 1/4 tsp salt and 1/4 tsp dried oregano. Mix together to coat the pita croutons. Give one of pita croutons a taste and add more salt and oregano as needed. Place pita croutons on the parchment lined baking sheet in a single layer (use 2 baking sheets if needed) and bake in the preheated oven for 10-15 minutes until golden brown and delicious. Remove from heat and set aside until ready to use. In a large salad bowl add 7 ounces chopped romaine lettuce and top with 1/2 pint grape tomatoes, sliced in half, 1 1/2 cups diced English cucumber (see note #1), 1/2 cup diced green peppers, 1/2 cup sliced red onion, 1/4 cup Kalamata olives, halved, 1/2 cup crumbled Feta cheese, pita croutons, and the fully cooked and sliced Greek marinated chicken. Serve the Greek Gyros Salad with tzatziki dressing and enjoy! 1. Use an English cucumber (aka hothouse cucumber). English cucumbers are longer and more slender than regular cucumbers. They are typically not waxed so you'll find them wrapped in plastic instead. The seeds of an English cucumber are smaller and easier to eat. No need to remove the seeds when using in the salad. I like to cut about 1/2 the cucumber into strips and then dice.